Delinquencies in closed-end loans fell slightly in the second quarter, driven by a drop in home equity loan delinquencies, according to results from the American Bankers Association’s Consumer Credit Delinquency Bulletin. The composite ratio, which tracks delinquencies in eight closed-end installment loan categories, fell 3 basis points to 1.35% of all accounts – a record low. This also marked the third year that delinquency rates were below the 15-year average of 2.21%. The ABA report defines a delinquency as a late payment that is 30 days or more overdue. This is good news but the personal financial health of consumers in the USA is still in need of significantly improvements to their balance sheets. Debt levels are still too high. Savings levels are still far to low. Home equity loan delinquencies fell 4 basis points to 2.70% of all accounts, which helped drive the composite ratio down. Other home related delinquencies increased slightly, with home equity line delinquencies rising 6 basis points to 1.21% of all accounts and property improvement loan delinquencies rising 2 basis points to 0.91% of all accounts. Home equity loan delinquencies dipped further below their 15-year average of 2.85%, while home equity line delinquencies remained just above their 15-year average of 1.15 percent. Bank card delinquencies edged up 1 basis point to 2.48% of all accounts in the second quarter. They remain significantly below their 15-year average of 3.70 percent. The second quarter 2016 composite ratio is made up of the following eight closed-end loans. All figures are seasonally adjusted based upon the number of accounts. Home equity loan delinquencies fell from 2.74% to 2.70%. Mobile home delinquencies fell from 3.41% to 3.17%. Personal loan delinquencies fell from 1.44% to 1.43%. 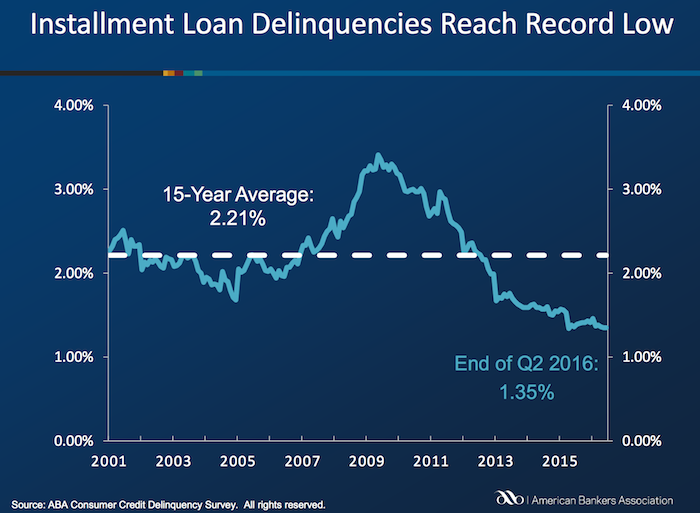 Direct auto loan delinquencies rose from 0.81% to 0.82%. Indirect auto loan delinquencies rose from 1.45% to 1.56%. Marine loan delinquencies rose from 1.03% to 1.23%. Property improvement loan delinquencies rose from 0.89% to 0.91%. RV loan delinquencies rose from 0.92% to 0.96%. Bank card delinquencies rose from 2.47% to 2.48%. Home equity lines of credit delinquencies rose from 1.15% to 1.21%. Non-card revolving loan delinquencies rose from 1.57% to 1.65%.